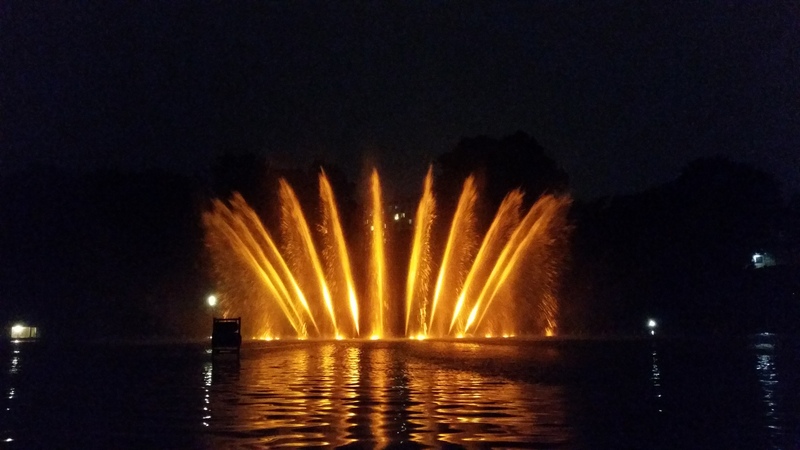 In the middle of the lake, a huge fountain comes to life, shooting jets of water into the air as colorful lights shine upon them. The whole thing is set to music. The show is put on by two unseen performers, one controlling the water, the other the lights from the keyboard of the Wasserlichtorgel – water light organ. Arrive early – at least 15 minutes before the show starts – to get a good seat. Bring a blanket to sit on in case the grass is wet. It’s perfectly legal to drink in public parks in Germany, so feel free to pack some beers or a bottle of wine and some plastic cups. The show takes place every day in summer and is completely free. A few times a year, the show is accompanied by fire acrobats. The next acrobatic shows for the 2017 season are August 26 and September 16. For an up-to-date calendar of acrobat shows and the current musical selection, visit the website of the Planten un Blomen park.